An angel stood in my room and said to me audibly, “Doug Addison, get up and write!” I got up and wrote down what I felt was God speaking to me. That was the start of a series of encounters that forever changed my life and that of thousands of people who have been impacted by my prophetic words, books and training. Prior to that experience I had never written a book or published a prophetic word for wide release. I went on from there and struggled for the next three years trying to write down all the revelation and life experiences God had revealed to me. I finally cried out to God for a divine strategy from Heaven on how to complete this book that I was being called to write. Once I got the strategy, I was able to write the initial manuscript in a matter of three weeks. I was able to write my second book in thirty days. I know this sounds like hype but it truly came as a strategy from Heaven. I am not saying it was easy, as it did take some focused work to write a book that fast. 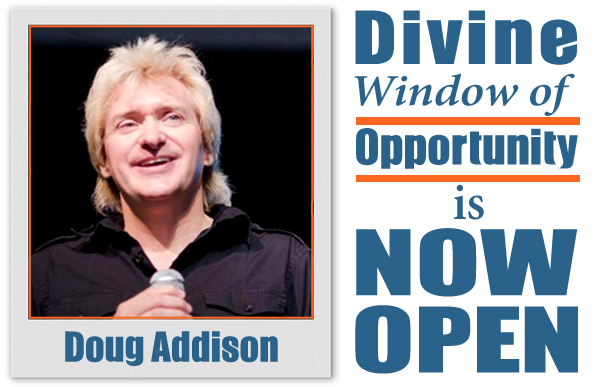 I recently released a prophetic word that Opportunity is Knocking on your door right now. God is opening up amazing doors this year for us to break through the things that have held us back in the past. I had a prophetic dream in which I saw a worm eating the words off of a computer screen as fast as they were being typed. I knew that this was an attack of the enemy to stop people from writing. There are redemptive parts of your life experience that will set other people free. This is why the enemy is trying to hold you back from writing your book or blogs. I recorded a special free activation video especially for You. This will help you activate the opportunities that are before you right now. I responded to the recent dreams and prophetic words I have been receiving by putting together an online training course that contains the strategy I got from God on how to write your story or book. This is not just a teaching. It contains step-by-step instructions and all the tools and templates you need to write and self-publish your own book. This is a DIY kit to get your book or story written. – This is a never-released second edition that contains tips on how to write, get an ISBN, copyright, plus publishing on Kindle. Click here. That is over four hours of practical online video instruction and impartation by Doug Addison. Plus dozens of worksheets, templates and exercises that will jumpstart your writing or self publishing process. You feel called to write a book but you do not know where to start. You have a story or experience that could help others. You are a speaker and need to get your message into a book. You are looking for a graduation present for someone. Dear Doug, I was praying and spending time with God. I picked up my phone and amazingly I must’ve left this on their from day before. Never saw it before.Can’t explain how it got to your sight. Wow it scared me,because I know I suppose to be writing books, but I don’t know where to start. This seems like the answer to my situation. I missed the date,and was wondering what could I do to get the materials . I know God used you to write this. I’ve received your email about the package you are offering for $77 until June 16th. I would like to purchase this package but can’t see where to pay for it. Please let me know how to do this. I have written one book already and I wish I’d had access to your workshops before I did that. I have another book on my heart and I’m really excited about what you have to share.